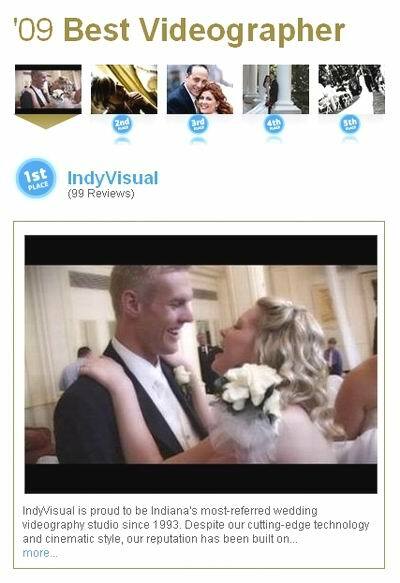 Great news – IndyVisual has been voted Indy’s Best Videographer on the WTRV/IndyChannel.com’s A-List! Now, I’m as big a critic as anyone else about the idea of a poll that measures quality by how many people one can recruit to vote. I avoided the common practice of soliciting votes through blogging, tweets, Facebook status updates and mass e-mails to family and friends outside the industry. Only clients and wedding professionals, people who could truly gauge our worthiness, knew of our nomination – not even my wife knew or voted. So the fact that so many clients and fellow professionals showed their support and wrote such wonderful comments means more to me than any title. A big THANK YOU to all those who voted, and congrats as well to my many talented friends who won or finished in the Top 5, four of whom are right here in my building! 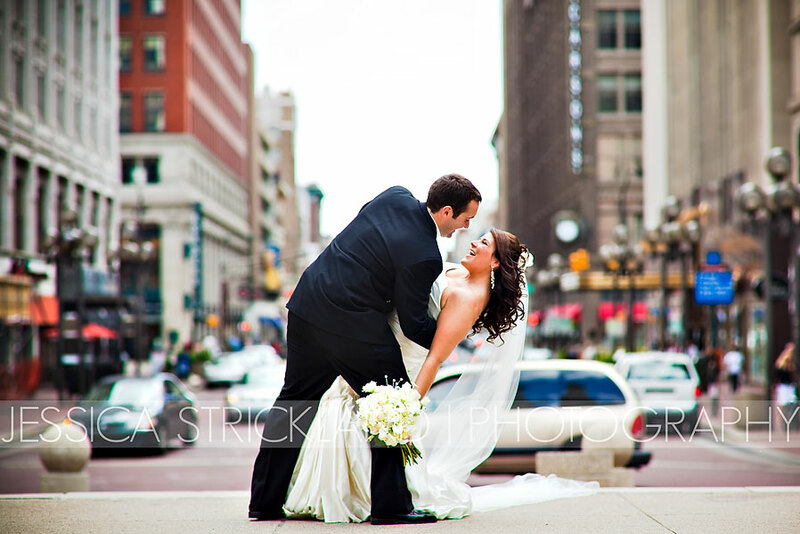 Stephanie & Josh became man and wife at St. Luke’s United Methodist Church before celebrating at the Omni Severin downtown, who referred them to us. Working alongside photographer Laszlo Kiss, Videographer Rich Johnson captured all the details, including the radiant makeup by Kiralee, beautiful decor by The Painted Daisy and awesome tunes by the Wendy Reed Band. I especially loved the father’s moving speech, which included several keepsakes from Stephanie’s childhood. Maggie & Chris tied the knot at North United Methodist Church before celebrating downtown at the Columbia Club, with a quick stop on the Circle for photos in between with photographer Morgan Matters. Flowers were clearly a top priority, as evidenced by the abundant bright rainbow of colors at both locations provided my McNamara Florist. 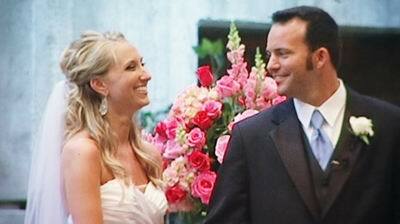 Maggie & Chris met in a church rock band, but left the evening’s music to DJ Jason Fritz of Pro-Sound Entertainment. 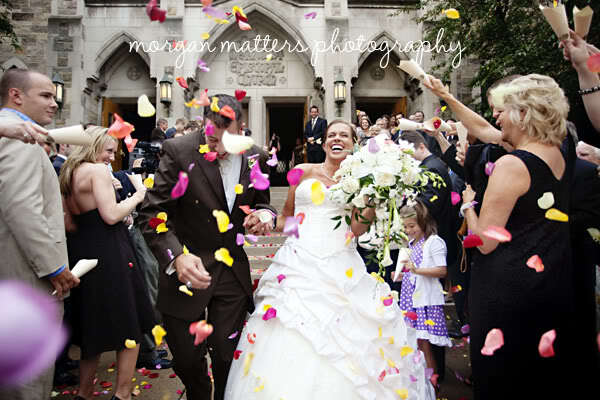 I loved the couple’s carefree spirit and had a blast covering my second wedding for the Kleinhenn family. Jennifer & Michael were married under a splendid chuppah at Congregation Beth-El Zedeck (which was just for show of course, since they had already signed the ketubah) before celebrating at the Renaissance Hotel. Coby Palmer‘s floral design was exceptional as usual, and veteran band Double Exposure rocked, leading the crowd through an epic ten-minute hora. Special thanks to photographer Sue Huffer for the last-minute referral! 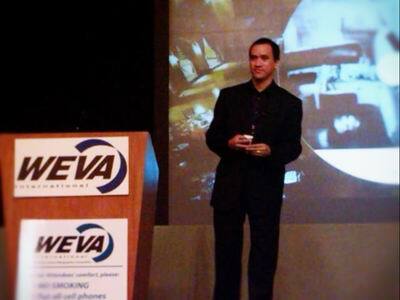 Speaking at WEVA Expo 2009! I am honored and excited to have been invited to be a speaker at WEVA Expo 2009, the world’s largest annual event videography conference, this September in Orlando. 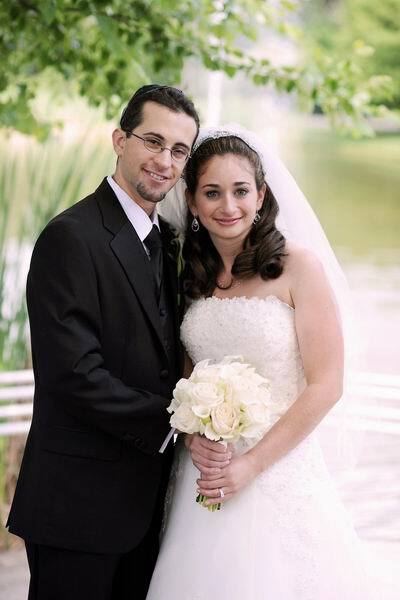 I first joined WEVA (Wedding & Event Videography Association) during the early years of my business, then called On the Spot Productions. My membership, as well as my experience at the conferences I attended, played a significant role in the early growth of this studio, culminating in my appearance on the cover of the official WEVA trade publication in 1996. All these years later, I am looking forward to giving a little back to the creative community that has given so much to me. Coming off the heels of being invited to be the official videographer of ABC’s (Association of Bridal Consultants) annual conference later this year, I’m feeling truly blessed indeed! Michelle & Kyle enjoyed a fantastic wedding weekend with a ceremony at St. Mary Catholic Church and a rockin’ reception with amazing Jimmy Buffett-themed decor at the Columbia Club. They brought a heavy dose of Margaritaville to the rehearsal dinner at Bella Vita as well. It was a pleasure as always to work with photographer and friend Jessica Strickland and my fellow We Do! neighbors Zanna-Doo and Indy Photo Booth.